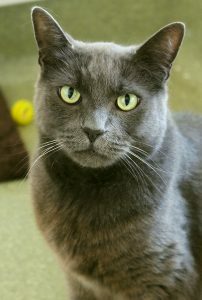 I am Mr. Kittums — I’m a stately gentlemen with the colorings of a beautiful Russian Blue kitty. I’m around 9 years old and am very affectionate. I have a very serious look to me but anyone who gives me a minute or two will learn that I’m a big softie. I like to rub up on people and will seek an open lap when I’m up and about. 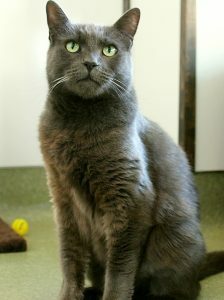 My fur is very soft and I have big, inviting green eyes that say, “Let’s be friends!”. Even though I am a bit older, I still have a ton of need for play and interaction, and would probably do best in a larger space where I can climb and explore! Since I am declawed, I should be an indoor-only kitty. I am ambivalent to other cats being around, and tend to walk away from confrontation. I’m a lover, not a fighter. Unfortunately, I was previously de-clawed and so only have claws left on my back feet. Other than that, I’m in excellent health. I don’t ask for much — all I need is a soft place to lay and some people to shower with affection in a home that I can call my own. Would you fancy a man like me? Stroll over to Petco Unleashed on NW 23rd & Burnside today! I come to you fixed, vaccinated, and micro-chipped for an adoption fee of $100.